The Killing Room opening line: The powdery residue dusted Nieddu’s hair white: it sat in his eyebrows and on his lashes, but even beneath it the stonemason was ghost-pale. The book is set around the Palazzo San Giorgio and its seemingly wealthy inhabitants. Sandro is tasked to solve various criminal issues that have arisen and which result in him discovering why his preprocessor was killed and why there will be a cover up. 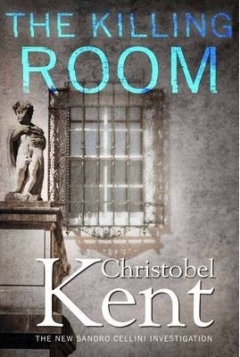 I have no clue what the ‘killing room’ had to do with the actual story and found this book difficult to read. At first I thought it was because I was not in a good mood when I started reading it, but Dave also struggled to read this book. Here we meet Sandro Cellini, a private investigator who lives in Florence. Having spent time in Firenze I at least was familiar with the location. I expected to read at the end that the book had been translated from Italian into English, as this is the sense I got when reading it. I am definitely intrigued and interested. I have to try to find this book in the store or on Amazon. Let me know what you think when you read it Kay! I was intrigued by the title alone but shame it didn’t live up to expectations! The title is what made me choose it! Sounds like one I won’t bother with – Tandy – thanks. Thanks again for your honest book review Tandy, I appreciate the realness of it. I always think that too, when I start a book and can’t sink my teeth into it that there’s something wrong with me, not the book because if it’s published, it must be good…right, nope, wrong! Publishing does not equate to good sadly!